… There are more than 40 contributors to this volume. The information, opinions, and insights they provide will help those such as I who have never attended a Berkshire Annual Meeting (and/or related events) to understand and — yes — appreciate how much those several days in Omaha mean to attendees personally as well as professionally. Their reminiscences of Meetings past are especially enjoyable as well as informative. ….. With an informality they prefer and one certainly appropriate to the Berkshire community, Larry and Stephanie are to be commended for brilliant editing of the original material they obtained, and then, the equally brilliant presentation of it within an eminently sensible framework. 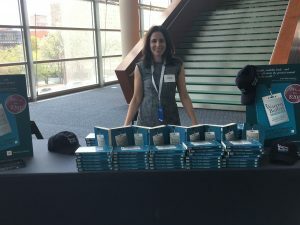 Authors of The Warren Buffett Shareholder Lawrence Cunningham and Stephanie Cuba have shared with us some fantastic images from the event in Omaha, which took place on Saturday 5th May. 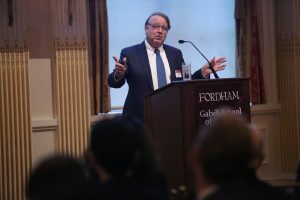 Lawrence A. Cunningham is an authority on corporate governance, corporate culture, and corporate law, and teaches business-related courses that span these fields. He has written dozens of books and scores of articles on a wide range of subjects in law and business. These include the leading textbook on accounting used in law schools, a popular narrative on contracts, and best-selling books on Berkshire Hathaway and Warren Buffett (The Essays of Warren Buffett: Lessons for Corporate America and Berkshire Beyond Buffett: The Enduring Value of Values). 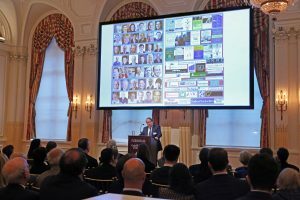 His extensive work has been published in top university reviews such as Columbia Law Review, influential professional journals such as Directors & Boards, and mainstream media such as The New York Times and The Wall Street Journal. Excerpted from Geico’s Tony Nicely’s essay, featured in “The Warren Buffett Shareholder: Stories From Inside the Berkshire Hathaway Annual Meeting,” edited by Lawrence Cunningham and Stephanie Cuba. 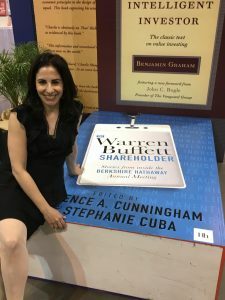 Author of The Warren Buffett Shareholder Stephanie Cuba has written a fantastic article explaining why the Berkshire meeting is like no other. Berkshire’s family of subsidiaries is often likened to an art collection, with Buffett the curator. 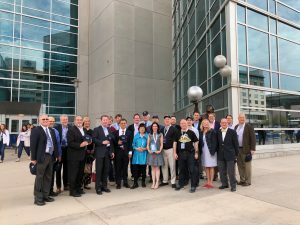 It’s not a stretch to portray Berkshire shareholders, at the meeting, as the visitors, patrons, and, yes, lovers of the curation, as well as the guides, docents and tutors for newcomers and recurring visitors alike. 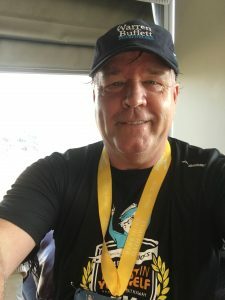 Steve Jordon is a reporter for the Omaha-World Herald. He’s been covering the Berkshire Hathaway Annual Shareholders Meeting for over a decade. 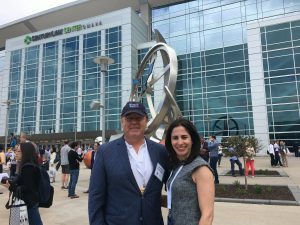 He’s also a contributor to The Warren Buffett Shareholder: Stories from Inside the Berkshire Hathaway Annual Meeting and joins Steve as part of the 5-part insider series of Buffet and Berkshire. Jordon draws parallels between the humble Buffett and the quaint town of Omaha. He explains what it’s like there when the meeting isn’t going on and providing helpful tips into what to expect when it is. 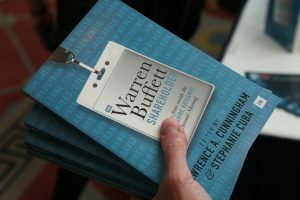 Steve Jordon, a reporter of 50+ years at the Omaha World-Herald, writes on how the meeting expanded to become an annual pilgrimage in the book The Warren Buffett Shareholder: Stories from inside the Berkshire Hathaway Annual Meeting. 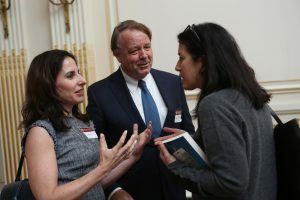 On Monday 23rd April, authors of The Warren Buffett Shareholder Lawrence Cunningham and Stephanie Cuba hosted the “Warren Buffett Lecture” at The University Club in New York to launch their latest book of Buffett essays. The authors were kind enough to share some fantastic pictures of the event, which was very successful. Please note: This website and special book offer is designed for customers in the US only – if you are ordering from outside of the US please use the Harriman House website.